EPE (Energetic Particles Explorer) were a series of spin-stabilized, solar-cell-powered spacecraft instrumented to measure cosmic-ray particles, trapped particles, solar wind protons, and magnetospheric and interplanetary magnetic fields. Explorer 12 was instrumented to measure cosmic-ray particles, trapped particles, solar wind protons, and magnetospheric and interplanetary magnetic fields. It was the first of the S 3 series of spacecraft. A 16-channel PFM/PM time-division multiplexed telemeter was used. The time required to sample the 16 channels (one frame period) was 0.324 s. Half of the channels were used to convey eight-level digital information, and the other channels were used for analog information. During ground processing of the telemetered data, the analog information was digitized with an accuracy of 1/100th of full scale. One analog channel was subcommutated in a 16-frame-long pattern and was used to telemeter spacecraft temperatures, power system voltages, currents, etc. A digital solar aspect sensor measured the spin period and phase, digitized to 0.041 s, and the angle between the spin axis and sun direction to about 3-deg intervals. The spacecraft functioned well until 6 December 1961, when it ceased transmitting data apparently as a result of failures in the power system. Good data were recorded for approximately 90% of the active lifetime of the spacecraft. The initial spin rate was 28.0 rpm, and the spin axis direction was right ascension 48 deg, declination -28 deg. The direction was nearly constant with time, and the spin rate slowly increased with time to 34.3 rpm. Apogee direction varied from about 1200 h to 0600 h local time. Explorer 14 was instrumented to measure cosmic-ray particles, trapped particles, solar wind protons, and magnetospheric and interplanetary magnetic fields. It was the second of the S 3. A 16-channel PFM/PM time-division multiplexed telemeter was used. The time required to sample the 16 channels (one frame period) was 0.323 s. Half of the channels were used to convey eight-level digital information, and the others were used for analog information. During ground processing of the telemetered data, the analog information was digitized with an accuracy of 1/100th of full scale. One analog channel was subcommutated in a 16-frame-long pattern and was used to telemeter spacecraft temperatures, power system voltages, currents, etc. A digital solar aspect sensor measured the spin period and phase, digitized to 0.041 s, and the angle between the spin axis and sun direction to about 3-deg intervals. The spacecraft functioned well except for the period from January 10 to 24, 1963, and after 11 August 1963, when the encoder malfunctioned terminating the transmission of usable data. Good data were recorded for approximately 85% of the active lifetime of the spacecraft. The spacecraft was coning (37-deg maximum half-angle) until 10 January 1963. After 24 January 1963, it was spin-stabilized at a rate of 10 rpm. This rate slowly decreased to 1 rpm on 8 July 1963. Initially, the local time of apogee was 0700 h.
Explorer 15 was instrumented to study the artificial radiation belt produced by the Starfish high-altitude nuclear burst of July 1962. The backup payload for Explorer 14 was modified and used for Explorer 15. The instrumentation included three sets of particle detectors to study both electrons and protons, and a two-axis fluxgate magnetometer to determine magnetic aspect. A 16-channel PFM/PM time-division multiplexed telemeter was used. The time required to sample the 16 channels (one frame period) was 0.323 s. Half of the channels were used to convey eight-level digital information, and the others were used for analog information. During ground processing of the telemetered data, the analog information was digitized with an accuracy of 1/100th of full scale. One analog channel was subcommutated in a pattern 16 frames long and was used to telemeter spacecraft temperatures, power system voltages, currents, etc. A digital solar aspect sensor measured the spin period and phase, digitized to 0.041 s, and the angle between the spin axis and the sun direction to about 3-deg intervals. During launch the spacecraft failed to despin. The spin rate ranged from 72.9 to 73.2 rpm during the life of the spacecraft. The spin axis pointed at right ascension 80.97 deg and declination 20.9 deg. 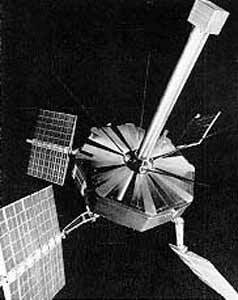 Explorer 26 was instrumented to measure trapped particles and the geomagnetic field. A 16-channel PFM/PM time-division multiplexed telemeter was used. The time required to sample the 16 channels (one frame period) was 0.29 s. Half of the channels were used to convey eight-level digital information. The other channels were used for analog information. During ground processing, the analog information was digitized with an accuracy of 1/800th of full scale. One analog channel was subcommutated in a 16-frame-long pattern and used to telemeter spacecraft temperatures, power system voltages, currents, etc. A digital solar aspect sensor measured the spin period and phase, digitized to 0.036 s, and the angle between the spin axis and sun direction to about 3-deg intervals. The spacecraft systems functioned well, except for some undervoltage turnoffs, until 26 May 1967, when the telemeter failed. The initial spin rate was 33 rpm, and the spin axis direction was right ascension 272.8 deg and declination 21.5 deg. The spin rate decreased with time to 2 rpm on 9 September 1965. For the balance of its life, the spacecraft was coning or tumbling at a rate of about 1 rpm. A back-up satellite of the Explorer-12 is on display in the Space Science exhibition station at the Steven F. Udvar-Hazy Center in Chantilly, VA.